Don’t bring her to the movies. This is where a lot of guys go for a “safe” first date. It’s relatively inexpensive (even with the overpriced sodas and popcorn), and doesn’t require any planning other than checking the movie times. But think about the environment: you’re sitting next to her for two hours in the dark and not talking. And there’s nothing particularly memorable about a trip to the local multiplex, especially if she winds up disliking the film. Nightclubs. This can be a hazardous environment for a first date. Nightclubs are for meeting friends or for macking on someone new. 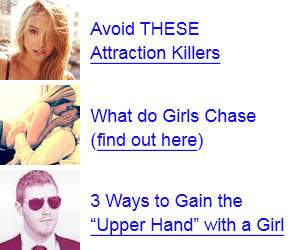 If you visit one with your date, there’s a good chance you will spot other girls you want to mack on. If so, you’ll be unfocused and your date will pick up on these vibes. Then there are the expensive drinks, lines for the bathroom, and often a lack of comfortable places to sit. The loud music makes it bad for conversation. Guys are all over the place, checking out your girl and waiting to move in if you leave her for five minutes. For these reasons and others, you’ll want to steer clear of nightclubs on a first date. Any event involving friends or family. These are very bad first date ideas.